ISIS is challenged not only on the battlefield but also ideologically by mainstream Muslim scholars and within militant circles. Hundreds of mainstream Muslim scholars have spoken out at international and local levels, both individually and collectively. The most important one being the Open Letter to Al-Baghdadi. The ideological challenge also comes from within militant circles especially rival groups operating in Syria and Iraq such as Jabhah Al-Nusrah and in other places such as Al-Qaeda which based in Yemen. One of the many criticisms directed against ISIS is its permissiveness in the practice of takfir (declaring a Muslim as apostate) which makes it status as a takfiri group deserved. This equates ISIS to the Kharijites who remain traditionally denounced and despised by Sunni and Salafi Muslims. This article seeks to analyze ISIS’ response to these challenges by mainstream Muslims and rival militants based on materials distributed online by sources known to have an affiliation to ISIS and distributors of its materials. ISIS’ doctrine on takfir could be found in a 40-points list entitled `Aqidah Wa Manhaj Al-Dawlah Al-Islamiyah Fi Al-Takfir (ISIS’ Creed and Methodology of Takfir). The list carries many similarities with ISIS’ publication entitled Muqarrar Fi Al-Tawhid Li Al-Mu`askarat (Standard Text for Islamic Creed for Military Camps), dated 1436 (Hijrah calendar) / 2015. Some of the points are also found in another ISIS publication titled Hazih `Aqidatuna Wa Haza Manhajuna (This is our creed and our way). All the above mentioned documents are distributed online by ISIS online machineries and among its online supporters. This article will focus on the 40-points list on takfir because of its concise and easily digestible content which also directly addresses the topic at hand. The point begins with a warning against all types of extremism in takfir. ISIS rejects the Murji`ite’s doctrines, a) al-irja’ (deferred judgment on faith) that views God as the sole authority to judge who is Muslim and who is not in the Afterlife, and b) Muslims should regard any person who is outwardly Muslim as part of the Muslim community even if he commits grave sin because sin has no adverse effect on salvation as long he remains faithful. ISIS’ stand on takfir is based on the creed of the Sunni and guided by the tradition of noble Sunni scholars. ISIS regards all who proclaim the Shahadah (Testimony of Faith) as Muslims, until proven otherwise. – it must be issued by ISIS’ authorised bodies. ISIS do not perform takfir on all Muslims today, or those who commit sins except if they regard them as halal (permissible), or those who do not join ISIS, or those who differ, criticise or fight ISIS, or Muslims who live in non-Muslim countries. – all practitioners of sorcery. One feature which stands out from ISIS’ materials on the issue of takfir is its attempt to deflect criticism from various parties that it is a takfiri movement which is deserving of its status as a modern day Kharijite who is denounced in various authentic hadiths and in Sunni tradition and to subsequently portray itself as a staunch Sunni movement that deserves support especially from jihadist circles and from Sunni Muslims in general. This could be deduced from the way the list was composed. Firstly, the first point in the list ironically asserts ISIS’ denunciation of all forms of extremism in takfir. Secondly, the first eight points seeks to inform what ISIS is not in the matter of takfir, instead of describing what its stand on takfir actually is. This indicates its apologetic tone due to various accusations of takfirism against it. This accusation which comes together with the Kharijite label does not come only from prominent individual scholars and Muslim bodies all over the world but also from radical jihadist circles such as leaders of Al-Qaeda. Abu Musab Al-Zarqawi who led Al-Qaeda in Iraq – the group that preceded ISIS – was counselled by his religious mentor Abu Muhammad Al-Maqdisi on, among other things, the former’s permissive approach to takfir as a justification for Al-Qaeda’s indiscriminate bombing of Iraqi civilians. However, three examples could be highlighted here that would expose ISIS’ mask of fidelity to mainstream Sunni tradition and its claim of rejection of all types of extremist understandings of takfir. First example is ISIS’ pronouncement of takfir on Hamzah Yusuf and Yasir Qadhi. Hamzah Yusuf is a Muslim scholar who heads Zaytuna College based in Berkeley, California, United States of America. Yasir Qadhi is also a Muslim scholar based in the United States. He holds a doctoral degree in religious studies from Yale University and a teaching position in the Religious Department of Rhodes College and is also the Dean of Academic Affairs at Al-Maghrib Institute. This pronouncement was publicly made known in Dabiq,which is ISIS’ official online magazine, issue number 7. Photo of both scholars were published with the caption “murtad” (apostate) for their condemnation of the assault on Charlie Hebdo. Theologically, this pronouncement falls under takfir mu`ayyan (takfir made against specific individuals or organisation). Other than the photos with the above mentioned caption published under an article that seeks to offer theological justification for the attack on Charlie Hebdo and condemn those who denounce it, there was no detailed explanation for this specific takfir based on the statement made by both scholars such as which aspects of the statements are deemed to cause apostasy and why and on what theological basis do these statements cause apostasy. There was also no clear explanation on the part of ISIS in detailing the process it has taken to make such pronouncements; whether ISIS has communicated to them its ruling and given them a chance to defend themselves against ISIS’ arguments and who were the scholars involved in making such rulings. These are pertinent questions which require answers which are as pertinent from ISIS based on the takfir methodology that it has laid down for itself in the list – takfir cannot be made based on speculation and must go through proper processes and no Muslims should be ruled otherwise except with evidence that is beyond doubt (yaqin). On this respect, ISIS has failed to adhere to its own doctrine of takfir. Since this is a serious theological matter, this failure is a serious non-compliance to the shari`ah on the part of ISIS. The second example which exposes the fundamental flaws of ISIS is its pronouncement of takfir on all Muslims who accept democracy, regard it as compatible to Islam and participate in its process. This pronouncement is problematic on many grounds. Firstly, the issue whether democracy is compatible with Islam or Muslims’ participation in it could be ruled permissible on rational and pragmatic ground are contentious among Muslim scholars. However, many Muslim scholars today would support democratic governments and permit Muslims’ participation in its process, regardless whether they live in Muslim countries or non-Muslim countries or their participation involves them being voters, election candidates or members of parliament. In addition to many works that promote such position such as Al-Qaradhawi’s Fiqh Al-Dawlah (Islamic Jurisprudence on Government), it is also supported by the participation of Islam based parties in democratic processes and also democratic governments in many Muslim majority countries which include Muslim scholars amongst their membership. Not only did ISIS’ pronouncement go against the mainstream position of Sunni Muslim scholars, it is also tantamount to pronouncing takfir on them and a significant number of ordinary Muslims. It is argued that this pronouncement of takfir by ISIS itself contradicts point 10 of the list that proclaims the foundation of ISIS’ creed and doctrine on the premise set by Sunni Islam which it explicitly affirms in Muqarrar Fi Al-Tawhid. The third example is ISIS’ pronouncement of holding Sunni Muslim scholars in high esteem and respect, although it also denounces those who take the crooked path and sell the religion for worldly pleasures. This pronouncement is problematic in view of the letter signed by more than 100 Muslim scholars from all over the world denouncing ISIS. 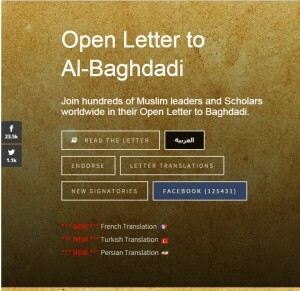 The letter lists down more than 20 points of ISIS’ serious transgression of Islamic teachings. “…..disbelief requires the intention of disbelief, and not just absentminded words or deeds. It is not permissible to accuse anyone of disbelief without proof of the intention of disbelief. Nor is it permissible to accuse anyone of being a non-Muslim without ascertaining that intention. It is, after all, possible that the person was coerced, ignorant, insane or did not mean it. It is also possible that he misunderstood a particular issue…. The above statement from the letter is relevant to ISIS’ pronouncement of takfir against Hamzah Yusuf and Yasir Qadhi mentioned in the above first example where there is no explanation on the ground and processes that lead to it. The statement also contradicts ISIS’ use of takfir in contentious theological issues such as the permissibility and compatibility of democracy with Islam. Up till now, there is no known response to this letter from ISIS. Finally, ISIS’ application of takfir against a wide range of people such as all members of unIslamic government apparatuses and unIslamic political parties is permissive and go against the prudence recommended in the final part of the quoted statement. ISIS’ doctrine and application of takfir contradicts also with the Amman Message that have been endorsed hundreds of eminent Muslim scholars and thinkers. This, in particular, relates to ISIS’ declaration of all Shiites as disbelievers. “1) Whosoever is an adherent to one of the four Sunni schools (Mathahib) of Islamic jurisprudence (Hanafi, Maliki, Shafi`i and Hanbali), the two Shi’i schools of Islamic jurisprudence (Ja`fari and Zaydi), the Ibadi school of Islamic jurisprudence and the Thahiri school of Islamic jurisprudence, is a Muslim. Declaring that person an apostate is impossible and impermissible. Verily his (or her) blood, honour, and property are inviolable [emphasis added]. Moreover, in accordance with the Shaykh Al-Azhar’s fatwa, it is neither possible nor permissible to declare whosoever subscribes to the Ash`ari creed or whoever practices real Tasawwuf (Sufism) an apostate. Likewise, it is neither possible nor permissible to declare whosoever subscribes to true Salafi thought an apostate. This declaration also rejects ISIS’ claim that Sunni Muslim scholars are in consensus about the disbelief of all Shiite scholars which it subsequently used to justify takfir against those scholars who refuse to perform it on Shiite scholars after explanation has been given (to the Shiite scholars). Any person familiar with Islamic jurisprudence would know that any claim of consensus (ijma’) among scholars is hardly uncontested, be it in the classical period or current times. This declaration is a contemporary testimony to it. It must be highlighted that the Amman message pre-exists ISIS. If ISIS is truthful about honouring Sunni scholars and the creed of Sunni Islam, it must not disregard the message. At the very least, it should explain why it deviates from the pronouncement endorsed by hundreds of contemporary eminent scholars. 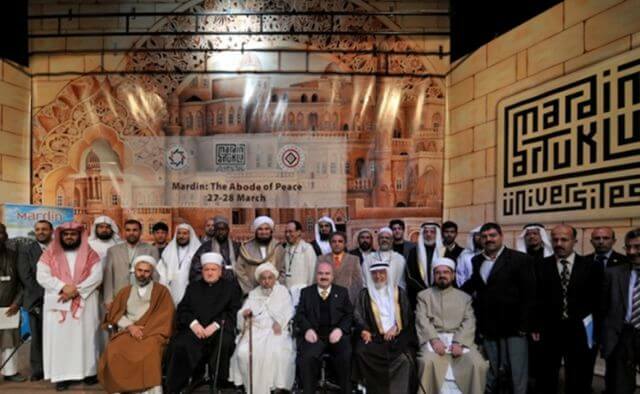 The third source highlighting the contradiction between ISIS’ doctrine of takfir and the position held by Sunni Muslim scholars is the Mardin Declaration. The declaration is an outcome of the Mardin conference which was attended by a group of renowned Muslim scholars in March 2010. It was convened to discuss the use of Ibn Taimiyah’s fatwa by radical and extremist groups to justify takfir, shedding blood of Muslims deemed to have apostatised and waging perpetual violent jihad against non-Muslims. “1) Ibn Taymiyya’s fatwa concerning Mardin can under no circumstances be appropriated and used as evidence for leveling the charge of kufr (unbelief) against fellow Muslims, rebelling against rulers, deeming game their lives and property, terrorizing those who enjoy safety and security, acting treacherously towards those who live (in harmony) with fellow Muslims or with whom fellow Muslims live (in harmony) via the bond of citizenship and peace. On the contrary, the fatwa deems all of that unlawful, not withstanding its original purpose of supporting a Muslim state against a non-Muslim state. Ibn Taymiyya agrees with all of this, and follows, the precedent of previous Muslim scholars in this regard, and does not deviate from their position. Anyone who seeks support from this fatwa for killing Muslims or non-Muslims has erred in his interpretation and has misapplied the revealed texts…. This declaration also precedes ISIS. Similar to the Amman Message, ISIS ought to explain its takfir doctrine vis-à-vis this declaration if it is truthful in honouring Muslim scholars, past and present. Al-Qaeda of the Arabian Peninsula, at least, took the effort to explain its disagreement with the content of this declaration via the late Anwar Al-Awlaki in its official magazine, Inspire no. 2. Here, it could be concluded that the above mentioned letter to Al-Baghdadi, the Amman Message and the Mardin declaration endorsed by hundreds of contemporary Muslim scholars are enough evidences that ISIS’ doctrine of takfir is incompatible with the position held by many contemporary Sunni scholars. ISIS’ doctrine does not tally with the position of contemporary Sunni scholars and in view of the contradiction, ISIS’ claim of upholding the scholars in high esteem is, in reality, a hollow statement. Its position also deviates from the Prophet’s advice, “My people/followers will not be in agreement over misguidance. When you differ in opinions, be with the Al-Sawad Al-A`zham (the majority).” (Narrated by Ibn Majah). ISIS’ attempt to deflect the label of takfiri and Kharijite falls apart in view of the above three examples cited in this article. The examples expose ISIS as a wolf in the sheep’s clothing. ISIS tries to paint an image of a movement that is truthful to Sunni Islam but the reality is that it is an enemy that is destroying it. The analysis by this article is significant because it provides an ideological challenge and contestation which further downgrades ISIS’ appeal. One who is familiar with the online debate especially when they come from within jihadist circles can appreciate why such ideological contestations matter to ISIS. An example can also be found in several issues of Dabiq where ISIS dedicates lengthy article disparaging Al-Qaeda and its associates in response to their ideological challenge. I would like to thank Mr. Hafiz Kusairi for his valuable technical assistant in preparing this article. Muhammad Haniff Hassan and Mustazah Bahari, “An Analysis of Muslim Voices Against IS”, Eurasia Review, 1 October 2014. Al-Dawlah Al-Islamiyah Hai’ah Al-Buhuth Wa Al-Ifta’, Muqarrar Fi Al-Tawhid Li Al-Mu`askarat, 1436H, available at https://dump.to/muqarartawhed (4 Aug. 2015). Hazih `Aqidatuna Wa Haza Manhajuna, Maktabat Al-Himmah, available at http://justpaste.it/matweat (4 Aug, 2015). See Al-Dawlah Al-Islamiyah, Muqarrar Fi Al-Tawhid, p. 31-2; Hazih `Aqidatuna Wa Haza Manhajuna, p. 3-4. See Ibid; Ibid, p. 3. See Hazih `Aqidatuna Wa Haza Manhajuna, p. 3. See Al-Dawlah Al-Islamiyah, Muqarrar fi Al-Tawhid, pp. 23-50. See Hazih `Aqidatuna Wa Haza Manhajuna, p. 4. See Al-Dawlah Al-Islamiyah, Muqarrar Fi Al-Tawhid, pp. 34-9. See Ibid, p. 2; Al-Dawlah Al-Islamiyah, Muqarrar Fi Al-Tawhid, pp. 41-2. See Joas Wagemakers, (2011) “Reclaiming Scholarly Authority: Abu Muhammad al-Maqdisi’s Critique of Jihadi Practices”, Studies in Conflict & Terrorism, 34: 7, pp. 523-39. 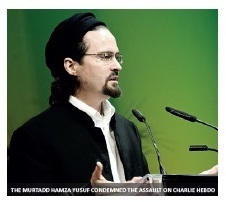 See Hamza Yusuf’s short biography at https://www.zaytuna.edu/academics/faculty/hamza_yusuf and http://shaykhhamza.com/biography/ (4 Aug. 2015). 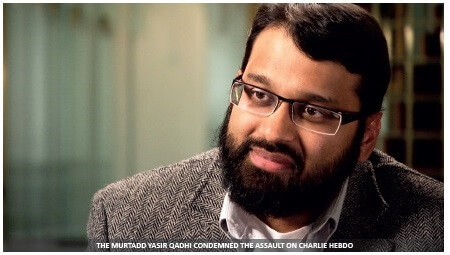 See Yasir Qadhi’s short biography at http://almaghrib.org/instructors/yasir-qadhi#profile and https://www.facebook.com/yasir.qadhi/info?tab=page_info (4 Aug. 2015). “The extinction of the gray zone”, Dabiq no. 7, Rabi` Al-Akhir 1436H, pp. 60-1. Tauseef Ahmad Parray, Democracy in Islam: The Views of Several Modern Muslim Scholars, The American Journal of Islamic Social Sciences, 27:2, pp. 140-8; Yaser Ellethy, Islam, Context, Pluralism and Democracy, New York: Routledge, 2015; Rashid Al-Ghanushi, Al-Dimuqratiyah Wa Huquq Al-Insan Fi Al-Islam, N.p: Aljazeera Centre for Studies and Arab Scientific Publishers, 2012; Muhammad `Ammarah, Al-Dawlah Al-Islamiyah: Bayn Al-`Ilmaniyah Wa Al-Sultah Al-Diniyah, Qahirah; Dar Al-Shuruq, 2007; Muhammad Salim Al-`Awwa, Fi Al-Nizam Al-Siyasiyah Li Al-Dawlah Al-Islamiyah, Qahirah: Dar Al-Shuruq, 2007; Muhammad, Muslih, Muslih Muhammad and Browers Michaelle. “Democracy”, The Oxford Encyclopedia of the Islamic World. Oxford Islamic Studies Online, available at http://www.oxfordislamicstudies.com/article/opr/t236/e0185 (10 Aug. 2015). See Yusuf Al-Qaradhawi, Min Fiqh Al-Dawlah Fi Al-Islam: Makanatuha, Ma`alimuha, Tabi`atuha, Mawqifuha Min Al-Dimuqratiyah Wa Al-Ta`addudiyah Wa Al-Mar`ah Wa Ghayr Al-Muslimin, Qahirah: Dar Al-Shuruq, 2001. See “Most Muslim Want Democracy, Personal Freedom and Islam in Political Life”, Pew Research Center’s Global Attitude Project, 10 July 2012, available at http://www.pewglobal.org/2012/07/10/most-muslims-want-democracy-personal-freedoms-and-islam-in-political-life/ (11 Aug. 2015). See “Ruling on democracy and elections and participating in that system”, Islam Questions and Answers, available at http://islamqa.info/en/107166 (11 Aug. 2015). Al-Dawlah Al-Islamiyah, Muqarrar Fi Al-Tawhid, pp. 32-3. 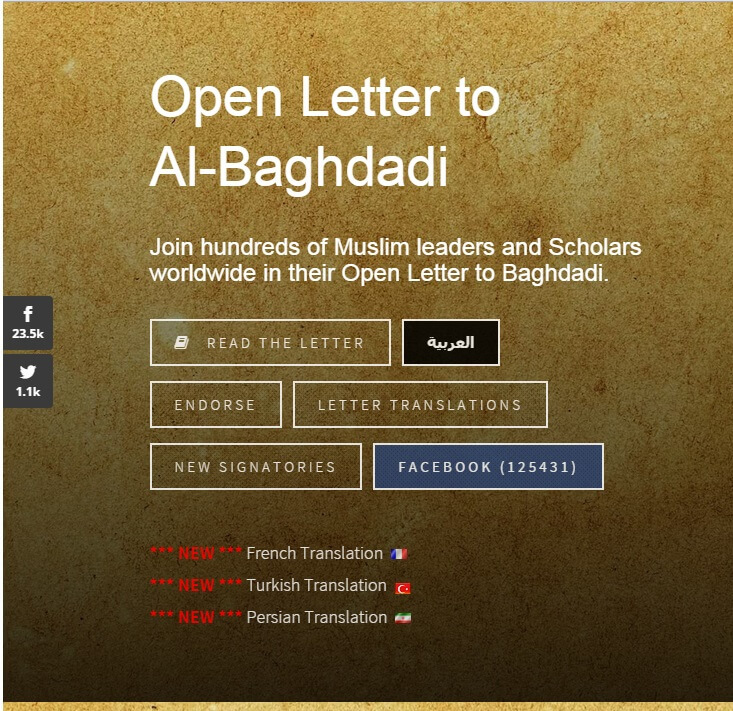 See Open Letter to Al-Baghdadi, point 9, available at www.lettertobaghdadi.com (4 Aug. 2015). See The Three Points of the Amman Message, available at http://ammanmessage.com/index.php?option=com_content&task=view&id=91&Itemid=74 (4 Aug. 2015). See The New Mardin Declaration, available at http://www.binbayyah.net/portal/en/tasrehaat/1038 (4 Aug. 2015). Shaykh Anwar Al-Awlaki, “The New Mardin Declaration: An Attempt at Justifying the New World Order”, Inspire no. 2, Fall 1431 – 2010, pp. 33-40. See Dabiq no. 7, 8 and 9.